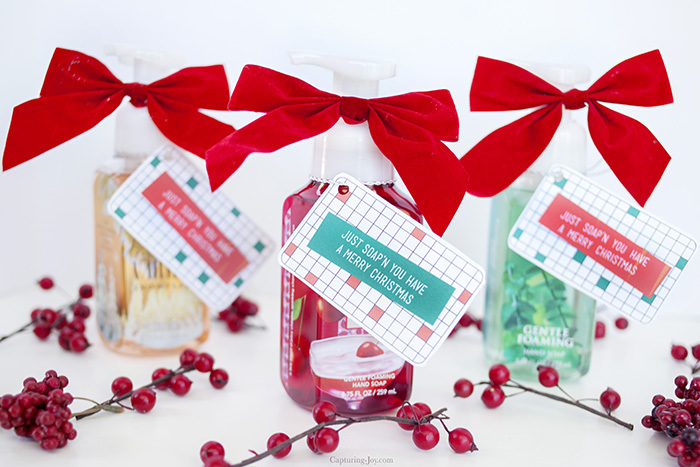 Soap Christmas Gift Idea – Dress up your favorite hand soap with this fun Christmas printable to make a great teacher gift or neighbor gift. If you love to recognize your friends, neighbors, and teachers with a Christmas gift, but can’t think of an idea, I’ve got you covered! Dress up your favorite seasonal hand soap with this fun Christmas gift printable to make the perfect Hand Soap Christmas Gift! 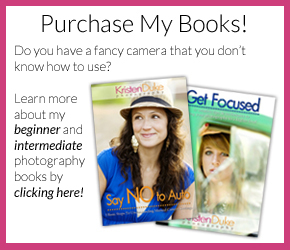 Everyone will surely love this useful gift! Grab your favorite yummy smelling soap and attach this printable tag to the top! Then, BOOM, you’re done! Your friends, neighbors, and teachers will know you are thinking of them this holiday. 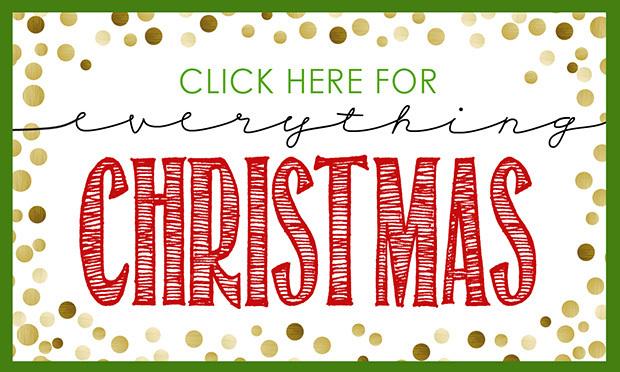 I originally saw the idea for the hand soap Christmas gift on my friend Brooke’s site, All Things Thrifty. 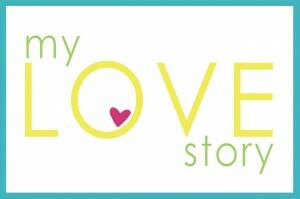 I loved the idea, but wanted to put my own spin on the design of the tag. Once the tag was completed, I grabbed some fun hand soaps. Bath and Body Works is a great place to find hand soaps in all colors and scents. A fun holiday flavor will make these soap Christmas gifts even more festive! I have a lot of people that I like to give gifts to, so it is important for me to find something that isn’t too expensive. And like everyone, Christmas is a busy season, so I love that these are quick to come together. This is a great gift to mass produce. Depending on what type of soap you buy, it can be $1-$4ish. Pick your favorite scent, cut out the tags, and attach them with a ribbon. 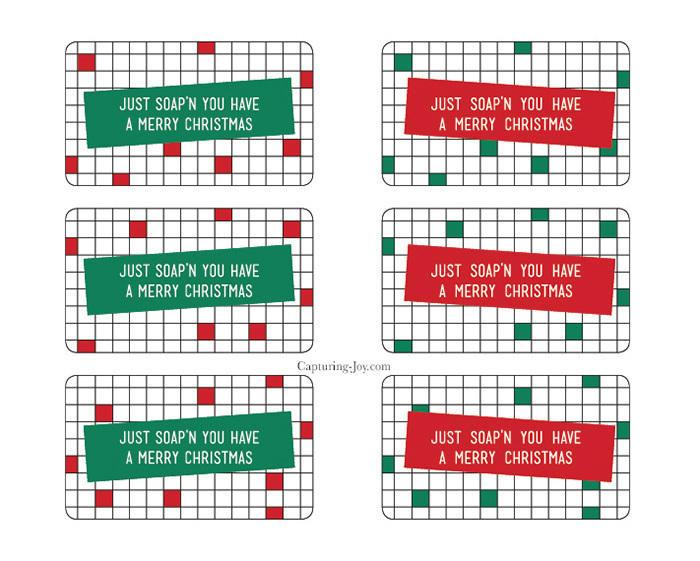 >>>>>>Download your own sheet of printable tags to make these cute Soap Christmas Gifts HERE! 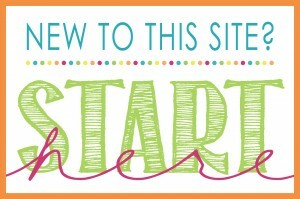 I also added a big red bow to the top for a little extra pizzazz!